Bright Club is where funny meets brains. 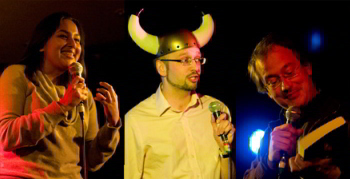 For the last 18 months, staff from UCL have been performing alongside stand-up comedians in the Wilmington Arms, sharing their knowledge and getting laughs out of topics like time, space, food and crime. Now, however, the Wilmington isn't enough for them, and they can pack out the Bloomsbury Theatre instead. For the tiny sum of £5 we were treated to short sets from We Are Klang's Steve Hall, the always wonderful Robin Ince and Simon Munnery, who also acted as compere for the evening. But the evening belonged to the academics and their take on the 'hidden treasures' theme. Chiara Ambrosio explained how Picasso got away with tupping his mate's girlfriend and giving him a painting commemorating the act, Subhadra Das found the link between Indiana Jones and cultural property policies, Mark Carnall came up with some more appropriate names for London's museums, Ruth Fillery-Travis revealed the worst thing that can happen to an archeologist* and Anne Welsh ended a short presentation on how to hide things in a library with a plea for retaining university funding for all subjects. There was also music - and a touch of opera - from flame-haired Strawberry and blonde Cream (we suspect these may be aliases). Bright Club will be back at the Bloomsbury in February, and on the strength of this we say it's not a moment too soon. If you want to get a taster of the live shows you should investigate their free podcasts, and keep an eye out for the next comedic lecture series at the Wilmington. * Getting covered in the black goo of a decomposing human body. Victorians: your sealed, lead-lined coffins were a terrible idea. Bright Club is monthly at the Wilmington Arms, Clerkenwell, and returns to the Bloomsbury Theatre on 4th February 2011, 7.30pm, £5. For more information see the Bright Club website or follow them on Twitter @BrightClubLDN.